Students of Colour is a collection of personal stories told by a diverse range of students from Black, Asian and Minority Ethnic backgrounds. We hope to share the varied lived experiences of students who often found their accounts ‘missing’ from other campaigns, celebrating them and their views. Stories will be informal and honest (presented in a similar style to the Humans of New York concept), offering both positive experiences of higher education and the challenges and barriers faced. 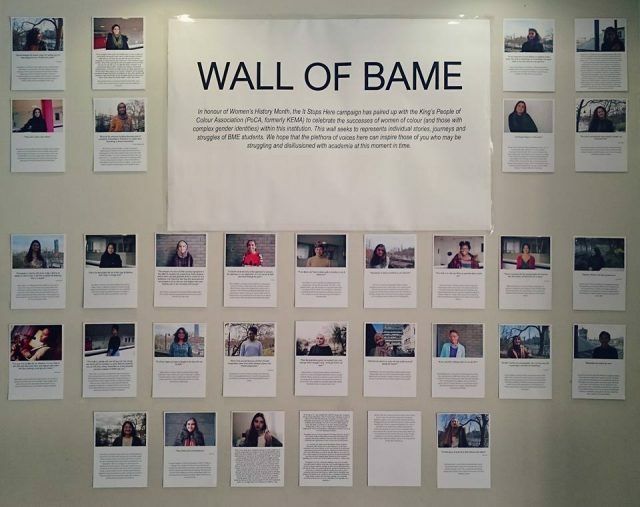 Aimed primarily at an audience of prospective students and those about to begin at university, this idea grew from a desire to replicate the success of campaigns which celebrated students of colour within a single institution (for example, see the Wall of BAME at King’s College London and #BlackMenofCambridgeUniversity) across a wider student body from London and beyond. You can follow the campaign via Instagram (@studentsofcolour) and Twitter (@studentsofcolou). Want to contribute? Please click here to tell us your story. Please click the link above if you’d like to contribute as a post via our social media platforms. We welcome submissions from any student who identifies as being from a Black, Asian or Minority Ethnic background. Whilst the form below requests some personal details to allow us to follow up with you about your submission, posts will only include a picture alongside your story, with no mention of your name or institution. We’re happy for students to write about any aspect of their journey to and through higher education, including your personal thoughts and experiences as a student of colour. You might want to try and answer one of the questions you had earlier in your educational journey. Consider discussing your previous experiences at school or college or in work, the transition to university, a social or academic experience etc. If you’re struggling to get started, some possible questions or topics are offered below. Around 200-250 words is ideal. Commuting to university from home – will I miss out on the uni experience? Is it worth studying a degree that’s not linked to a career? Will I be taught by many (or any) BAME staff? How do you know university is for you? Will I fit in? Is the learning environment cliquey? Will my culture be represented in the student body? I have family ties or community obligations – will I be able to juggle this with university life? Balancing a job with university study? After you submit your story using the form below, the project’s advisory and working group members will check for any spelling or grammar errors and make sure the image quality is high enough. We might get in touch by email afterwards to clarify wording or see if you might want to expand on something in particular, but we will not change any text without your permission. Once all is confirmed, we’ll then let you know when we plan to publish your story. The initial idea came from a collection of members of the AccessHE BAME forum in 2017. Since then, we’ve worked with students and staff from our member universities to put together the project and help us find contributors. A list of the project’s current advisory and working group members is below. If you’re interested in getting involved, please don’t hesitate to get in touch.